Learn from your leaders and trip-mates – about service and how we can serve others well, about how to improve as an athlete (whatever your level), about how to find your way up a 14,000 ft mountain, or even how to nail the perfect llama-selfie. 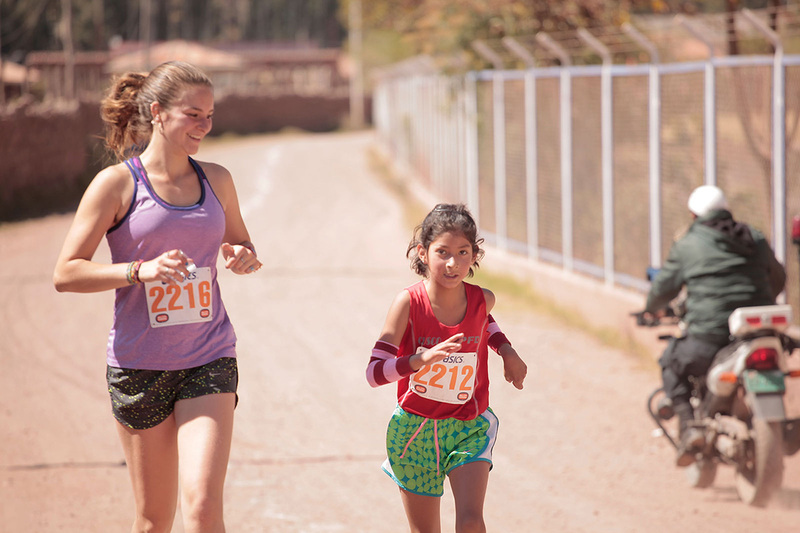 Explore the Sacred Valley by foot (if you’re a runner) on dozens of miles of beautiful dirt roads along the Urubamba River, push your limits at the gym, or take on some Peruvians in soccer or basketball. Take a plunge into the natural thermal hot springs of Lares, nestled into the cloud forest tucked away behind the mountains, for some recharging and relaxation. Try to count the stars at your campsite at 13,000 ft. en route to Machu Picchu. A cup of hot cocoa will help; it’ll take a while. 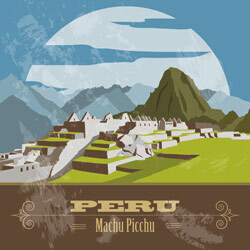 Marvel at the sunrise over Machu Picchu – there’s a reason it’s been dubbed one of the New Seven Wonders of the World. Let the memory sink in and share it with the new friends you’ve made. 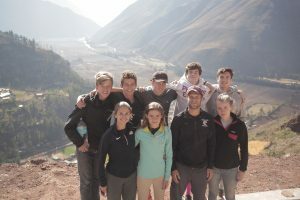 In Peru’s Sacred Valley, STRIVE student-athletes will enjoy settling into their Andes lodging in the colorful town of Pisaq. Located at over 9000 ft. (3000m) above sea level and about 40 minutes down the mountain from the ancient city of Cusco, Pisaq is best known for its Sunday market and giant Inca fortress towering on the hill overlooking town. With imposing (sometimes snow-capped) mountains in every direction, patch-work fields rimmed by vast 500-year-old terracing, and a night sky you have to see to believe, it’s easy to lose track of time as you take in the beautiful views. All service work begins with learning how to serve others. Before we pick up a shovel or step into a classroom, we’ll make sure we understand the complex idea of what it means to offer help as an outsider, what we’re qualified to do, and how to make sure our work is creating a positive, long-term, sustainable impact. The service projects that we do work on are always community driven and therefore often change from year to year. Projects that our students have undertaken in the past include working as teachers’ assistants in local school, helping tutor local students in STRIVE’s year-round, free after-school programs, and even promoting health and fitness through local sports days and our annual Pisaq 5K road race. Lastly, there may be days where you need to “get dirty” – clearing the local running track of brush, helping paint a building, or even helping dig at an ongoing Inca ruin excavation. 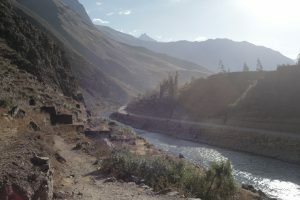 The dirt roads hugging the curves of the Urubamba River will be your main training grounds if running is your passion. If you’re not a runner, the training facilities on-site are available to meet your needs. You’ll be able to work out daily in the gym or even take a bike out along the river roads. There truly is something for every athlete: basketball courts, soccer fields, and just about anything your inner athletic soul could desire. The daily views and experiences are only the beginning of your adventure. On the weekends, you’ll enjoy day-trips through the Sacred Valley which may include: attending a professional Peruvian soccer match, hiking up a 14,000 ft peak, exploring the Pisaq ruins, or simply spending your free time bartering in the market and immersing yourself in Andean culture. The Sacred Valley always has more to offer than the time you have in country. Finish your trip with a 4-day hike to Machu Picchu that travels over some original Inca trails and see why this incredible city was recently named as one of the New Seven Wonders of the World. Upon initial arrival in Peru you’ll meet your group leaders in Lima and fly as a group to Cusco where our private transportation will meet us and bring us directly to Pisaq. You’ll stay at the beautiful Chaska Wasi Hotel, a tranquil location on the river banks with the rooms set around a beautiful, sunny courtyard perfect for a game of cards, a solitary reading session, or a group meeting. You don’t need to know Spanish in order to participate in STRIVE-Peru programs. That said, some knowledge of Spanish will help and you’re certain to get more out of your trip if you try to engage with the local people. If you have studied Spanish in the past, being surrounded by the language during this program will only enhance your ability to converse. It’s a wonderful opportunity to surround yourself with Spanish to improve your language abilities. If you are new to Spanish or wish to improve your Spanish before your trip, we highly recommend taking part in the STRIVE Spanish Immersion Program. Many of our students have voiced enthusiasm over learning Spanish during the trip, with a majority expressing a wish for a longer program. With this in mind, we have added an optional week-long program for students who wish to immerse themselves in Spanish language during their trip. If you’d like to improve your language ability, but don’t have time to take part in the Spanish Immersion Program week, Spanish lessons can also be arranged during the main STRIVE program as well for an additional hourly fee. This schedule is flexible and will change from trip to trip, based on the wants and needs of each particular group of students. We are always tweaking and altering our itineraries – particularly the weekend day-trips – to best suit the individuals of each trip and to account for the inevitable unpredictability that comes with travel in a foreign country. This is a sample schedule of what programs in the past have looked like. Your trip will likely look similar, but remember, this is YOUR trip and we design the trip around YOU. Day 1: Arrive this evening in the pre-determined departure airport for your group (Most groups meet in MIA). All students will be met by group leaders outside the ticket check in counter at the pre-determined departure airport and then fly as group to Cusco. We’ll do basic introductions and then hopefully get some sleep on the flight to Peru. Day 2: The group will arrive to Cusco, where our private bus will pick us up from the airport and drive us through the mountains to your new home at the Chaska Wasi Hotel in the village of Pisac. Spend the afternoon getting used to the altitude, making new friends, and planning your three-week adventure! Day 3: Continue exploring Pisac, getting to know your trip mates and staff, and start to learn about the service you’ll be doing – maybe even visit one of the projects you’ll be working on! In the afternoon, (if your body is feeling up to it) join the group on a first easy run along the river through the mountains. Days 4-7: Use the cool mornings to get in a workout before enjoying a breakfast of smoothies, fruit salads, pancakes, and/or egg sandwiches at the local market. During the day, spend your hours learning about, planning, and then doing service work. You might be helping with English pronunciation in a reading classroom, clearing ground at an active Inca ruin excavation, or even cleaning poop out of the monkey habitats at the local animal rescue sanctuary. Get home in time for some rest or a second workout. Have dinner with your new friends before an evening where you might have a STRIVE Talk from your college interns, game night, or just free time to relax. Day 8: Get in a long run or other workout in the morning and spend the rest of the day exploring the city of Cusco – visiting Inca sites, food markets, and even catching a Peruvian soccer match! Day 9: Run, workout or take a rest day in the morning before leaving for a day hike into the Andes. You can explore the the expansive ruins overlooking the town or even set your sights on the infamous 14,000 ft. “Mt. Doom” which towers, craggily, over the whole valley. Have lunch way up on the ridge overlooking the Sacred Valley and then hike back down for an afternoon exploring the famous market! 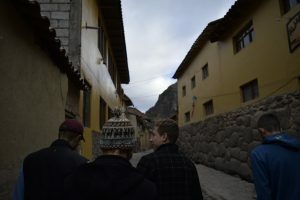 Days 10-14: Delve into Pisac! Continue your rhythm of working out in the mornings while the weather is cooler before tackling your service work for the day. Get in an afternoon workout when you get back before dinner with the group and activities or free time in the evening. Day 15: STRIVE Field Day and 5K! One of the service projects you’ve probably been working on has been planning and promoting these two great events. 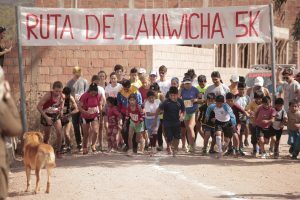 The 5K is a (now) annual road race put on by STRIVE for the local people of the Sacred Valley and Cusco and Field Day is an annual sports and games day for kids put on in conjunction with the local school. Whether you’re helping set up and run the obstacle course, handing out water at the 5K, or running in the famous STRIVE 4x400m relay, it’ll be a day to remember! tradition to tackle one of the most beautiful long-run (or bike) routes you can imagine. In Calca, Zaandra, a long-time friend of STRIVE, hosts us in her family’s hacienda for a picnic of local food, including “cuy” (guinea pig – a Peruvian delicacy)! Day 17: Get in an easy run before a beautiful drive over a high mountain pass and down into the cloud forest where we’ll spend the day relaxing at the Lares Hot Springs. What better way to chill before departing for the hike to Machu Picchu? Say “Adios” to Pisaq and spend the night in Cusco before an early departure for the trek! Day 18-20: Buenos Dias! Our private bus brings us to the start of our hike in the Andean town of Soraypampa. 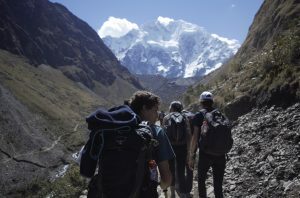 Spend the next four days bonding with your trip-mates as you trek through the stunning high mountain passes, following a route of the Incas some 500 years earlier. Day 21: Arrive at the incomparable Machu Picchu in the morning and spend the whole day exploring this New Wonder of the World. Catch the train out and arrive late back in Cusco to a warm quiet bed. Day 22: After breakfast (and maybe even a run if there’s time! ), we’ll have a final wrap up meeting where we review what we learned before saying a final “hasta luego” to our new friends and to Peru. From there you’ll fly with your leaders back to the pre-determined airport in the US and then on to your final flights home! What kind of student takes part in STRIVE-Peru? 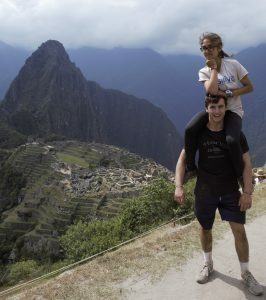 Students who come to Peru are looking to immerse themselves in new cultures and new experiences, while also being committed to their athletic training. Each day will be packed with learning and service, exploring a new place, and staying active. As in all of our programs, we are more interested in your dedication to the ideals of the program – service, athletics, and adventure – than in any quantitative measure of speed or ability. In Peru, we have had athletes who have been Division I college recruits all the way to students who just like to stay active but don’t consider themselves pinned to one sport. STRIVE participants have come from just about all sports: running, basketball, soccer, lacrosse, swimming, crew, field hockey, triathlon, hockey, skiing, wrestling. Whichever end of the spectrum you find yourself on or what sport is your passion, our group leaders and coaches will make sure you have the opportunity to push yourself as an athlete and as a person. 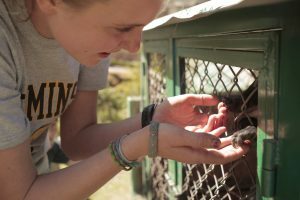 College students who are interested in STRIVE should read about and apply to the STRIVE College Intern Program, where you’ll learn about service, athletics, and adventure from a point of view of more responsibility. Adult runners of all levels (and even non-runners!) are welcome to join us on our 10-day trips specifically designed active adult travelers. Is Zika Virus a problem in Peru? The short answer is “no” – at least, not where we’ll be traveling. Our programs take place entirely at high altitudes where Zika is not present. For more info, read this longer post which includes links to the CDC, etc. What is the ISIC card and why do I need one? The ISIC (International Student Identification Card) is an internationally recognized student card. The ISIC card provides each participant with international medical insurance during their travels, including emergency evacuations if necessary, and even coverage for damaged/lost goods (depending on the plan purchased). Furthermore, the ISIC is the only accepted form of student ID for student discounts in many parts of the world. This applies to many activities we undertake as a group, including the Machu Picchu trip, and these rates are only honored if the participant presents a valid ISIC. The card costs $26 and easily pays for itself based on these student prices and the insurance provided. Please make sure to purchase the ISIC Basic version as the $20 card does NOT come with insurance. Feel free to find out more about these cards and how to apply at: https://www.myisic.com/get-a-new-card/ You might even be able to save on your own travels in the future! How difficult is the hiking portion of the trip? The trek takes you through the Andes, high up over a mountain pass next to majestic Salkantay Mountain, and then down into the cloud forest, before heading back up over a final high ridge from which we’ll get our first glimpse of Machu Picchu. The scenery is spectacular and the hike, while challenging, is very manageable for STRIVE participants, who will have spent several weeks at altitude already at that point. You’ll be way better prepared for the hike than most travelers. The trip won’t be a cake-walk, but with your training and acclimatization, you’ll be fine and it’ll all be worth it – we promise. If a student has particularly bad sickness (altitude or other) during the trek, our professional guides are well trained to deal with this and, in worst cases, students can be re-routed to lower elevation via car or horse. What do I need to bring on the trek? What will I need to carry during the hike? We’ll send you a complete packing list prior to departure. But in general for the trek you will need to have a day backpack (the one you use for school is likely to be sufficient), strong footwear (running shoes are okay if you do not have hiking boots), one complete change of clothing, sweater, jacket (fleece or another light, small, and warm), water bottle (metal or nalgene type – potable water will be provided as necessary), flashlight or headlamp and batteries, broad-brim or peaked cap, sunblock, insect repellent, toiletries, camera and spare batteries. A sleeping bag will be provided for you during the trek but if you prefer using your own sleeping bag or want it for other parts of the trip feel free to bring it along. You also need to bring your ISIC card and original passport with you on the trek. There will be a team of donkeys to carry all of the heaviest items such as tents, food, foam sleeping mats and cooking equipment. Each day the guides and donkey-drivers will set up camp in advance of the trekkers’ arrival and start to prepare dinner. Tents are two person A-frame style and there is a communal dining tent for eating. A change of clothes and your sleeping bags will also be carried by the porters or donkeys (with weight limitations) so that you need only hike with a day pack. Do I need to bring hiking boots? If you have them and they’re broken in, then it’s probably good to have them. If you don’t then running shoes will generally do. We do not recommend trekking in sandals or using new boots. Make sure that whatever shoes you bring are sturdy enough for the duration of the trek and know that they may get muddy, dusty and dirty! Where can I store the bags that I do not need to take on the trek? All of your belongings will be put into safe storage at our hotel in Cusco while you are hiking. We’ll meet up with our bags after the trek as we spend our last night of the trip in Cusco before flying home the following morning. What is the weather like in the Andes during the summer? In general, in Pisac, during the day when the sun is out, it can be very hot, between 70 and 80F. The sun is quite powerful so we recommend you wear sun-screen and keep hydrated as much as possible. In the early morning and evening, however, it is quite cold once the sun retreats behind the surrounding mountains, and temperatures can get as low as 30 degrees on a cold morning/night. In the morning, you’ll probably run in pants or tights and a long sleeve shirt, maybe even a hat and gloves, while in the afternoon, just shorts and a t-shirt will be fine. May to August is the dry season so you are unlikely to experience a lot of (or any!) rain in Pisac. For the hike, the temperatures are similar, but could be a bit cooler at the highest points, and much warmer on the third and fourth days as we near Machu Picchu and the more humid lower elevations. We’d recommend you bring plenty of layers which you can take off as the day progresses. Pants that zip off at knee level are ideal and t-shirts, long-sleeved shirts and a warm fleece are also recommended. It can rain in the lower cloud forest around Machu Picchu, so a poncho is a good thing to have, too. Is the water in Peru safe to drink? The tap water is not potable in Peru. Purified water is readily available and is included in STRIVE’s programs for all meals. If you want extra water, it might be worth investing in a SteriPen – a device which uses UV light to kill the nasty stuff in tap-water that makes you sick. STRIVE members have been using Steripen’s for years now in country and they are an effective method of sterilizing water. How much Spanish will I use/need on this trip? All of the group leaders on this trip speak English and Spanish fluently, so if you don’t speak Spanish, they’ll look after you. However, if you have or are studying Spanish and want to use it, you’ll have plenty of opportunities during your trip. In Pisac, outside of the few tourist hubs, few people speak anything other than Spanish or Quechua, the local Andean language. At the service projects where you’re working, as you explore the town, and in many of your daily interactions you’ll have ample opportunities to hear and speak Spanish. If you want to get the most out of your trip, we really recommend you check out our Spanish Immersion Program, which will let you get a head start on the language so you can interact with the locals and fully immerse yourself in the culture. If you don’t have time for the extra week, you can also sign up for Spanish language classes during the main 3-week trip. Tuition does not include: International and domestic airfare which must be purchased through STRIVE (see Flights tab), Visa charges, overweight luggage fees, snacks and beverages outside of meals, personal spending, massages and sports therapy services, internet or cell phone access fees, tips for additional assistance (e.g. sports massage, etc). We want to offer the safest and simplest travel options for our students (and parents), so all STRIVE high school students are highly encouraged to travel to Peru as a group from our pre-determined US departure airport. For STRIVE-Peru 2019, participants will meet their leader at a pre-determined location in the U.S. hub airport at least 4 hours before the international flight’s departure (exact time TBA). Families are responsible for arranging transportation to and from the hub airport, though STRIVE can assist in these bookings as well. Students will be accompanied to Peru where their leader will help the group navigate passport control and customs and meet the rest of the staff. 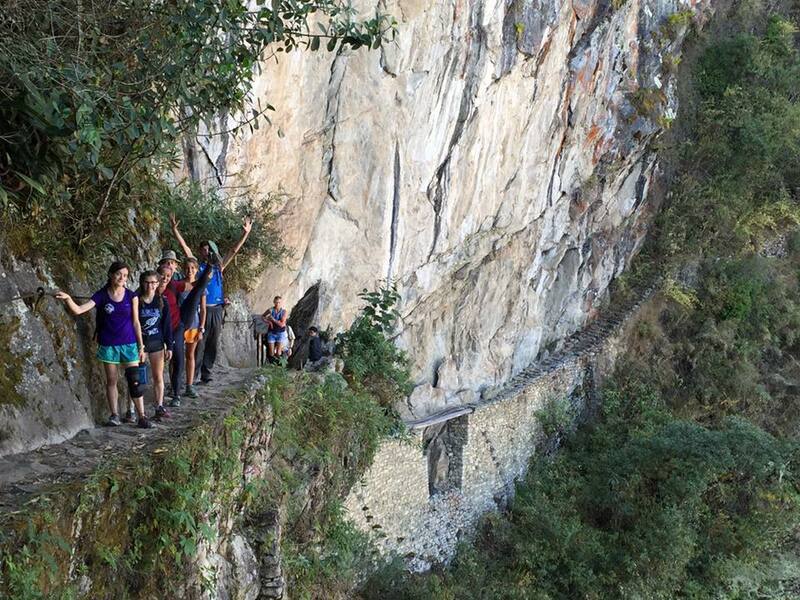 The next morning, the group will fly together from Lima to their final destination of Cusco. On the return flight, students will be chaperoned out of Lima, Peru, through passport control, and back into the US. Once in the hub airport, staff will help direct students for their flights to return home. If you’d like to discuss the possibility of using miles for the international flight, purchasing a flight that meets the group in Cusco or have other issues that may impact your ability to join the group flight, contact us and we’ll work with you to find a solution. Improve your Spanish – from native speakers who understand how to teach both the language and the culture; whether you’re a total beginner or have years of experience, you’ll benefit from 5 hours of daily language instruction with a maximum ratio of 2 students per teacher in the classroom. 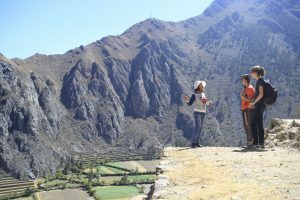 Live like a “local” as you settle into your home-stay, learning first-hand about the way of life in Ollantaytambo. Make the most of an extra week of high altitude training and acclimitization while exploring the Sacred Valley and bring those gains home for your fall practices. Explore the ancient Inca ruins that you’ll be able to see from anywhere in town and marvel at the streets paved by the Incas and the 500-year-old canals that still function today. Feast on home-cooked local cuisine three times daily and try to decide (you won’t be able to!) which dish you like best. Ollantaytambo – it’s hard to pronounce, harder to spell, but you’ll love the quaint charm of this thousand-year old Inca city. 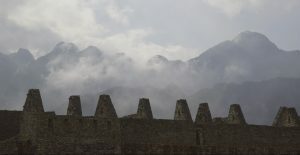 With original Inca cobble-stoned streets and spectacular mountains covered in the remains of ancient fortresses, there’s something to marvel at in every direction. 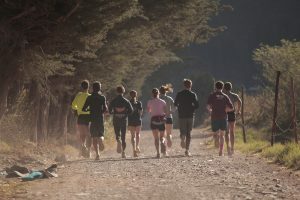 On your runs, leave the cobblestones as you explore this quiet end of the Sacred Valley on miles of rolling dirt roads, taking you through wide-open pastureland or below the imposing gaze of 19,000 ft snow-capped mountains. Between all this, relax in your own homestay with a local Peruvian family – more on this below. With so much going on, you’ll be ready for a good night’s sleep each evening. It’s a setting you won’t want to leave and won’t soon forget. Whether you’ve never spoken “Hola” or you’ve been taking Spanish for years, there’st tons to gain from the Spanish Immersion Program week (and, seriously, we’ve had students who have literally never taken a Spanish class; yes, you can do this and it will be fun.). You’ll receive 25 hours (5 hours per day for 5 days) of instruction from professional and experienced teachers at the Awamaki Spanish School. Classes will be split up by ability and will have a maximum of two students per teacher. Don’t worry, it won’t be all worksheets and reading. While part of your days will be spent in a traditional classroom setting, we believe in practicing conversation – listening and speaking – in addition to writing. 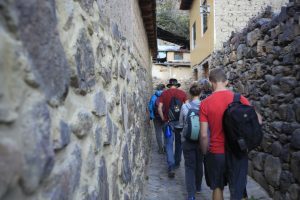 You’ll spend a portion of each day with your teacher on walks around Ollantaytambo town, through the markets, and around the various ruin sites, all the while practicing your Spanish comprehension and speaking (and learning about this amazing place!). And don’t forget about your homestay family – though they’re used to English-speaking visitors and can communicate enough to get by if need be, you’ll be speaking Spanish with them at home, at meals, and sitting around the TV watching Spanish game shows in the evening. Even your group leaders (and, hopefully, your trip-mates) will speak to you in Spanish while you’re out on runs in the mornings or walking back and forth to school in the afternoon. Don’t worry if you’re nervous about not being able to communicate – it’s all part of the fun! One of the many benefits of taking part in the SIP week is the ability to spend another week at altitude. Not only do you get an extra week of training, but you’ll give your body an extra week to adjust to the 9000+ feet above sea level and the lack of oxygen. Thus, by the time you get to Pisac and the rest of the group is just arriving, you’ll already be hitting your stride. Spanish Immersion Program participants will have the same ability to exercise daily, with group runs/bikes leaving in the mornings each day. For other-sport athletes, training can be accommodated, though Ollantaytambo is a smaller town than Pisac and lacks the fully stocked gym we have there. Delve into Spanish, Andean, and Inca culture as you settle into your homestay in Ollantaytambo. The “I” in SIP stands for “Immersion” and our goal is for you to totally immerse yourself in this amazing place and these amazing cultures. 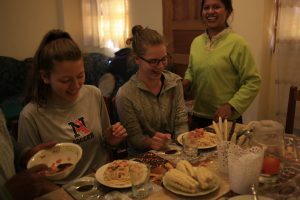 Learn from your home-stay family about their lives in modern-day Peru, ask your teachers about the history of the region, or talk with your group leaders and trip-mates about what you’ve learned. Be it food or language or dress, you’ll be an expert by the time you say “hasta luego” to Ollantaytambo at the end of the week. As part of the “immersion” experience, you’ll stay in the house of a local Peruvian family during your week. Our homestays are arranged through a local non-profit which partners with families in town who are trained and accustomed to hosting foreign visitors. You’ll generally be placed in a home with one fellow STRIVE participant. Each family is unique but many have large, multi-generational families, from older “abuelitas” (grandmas) down to the youngest children – and pets. Your room will likely be a very basic, but comfortable space. All homes have electricity, though only some have hot water. Still, whatever you’re missing in basic comforts will be made up for in warmth from your Peruvian family and all the home-cooked food that you can eat – or maybe more. Day 1: Leave home and meet your group and flight chaperones in Miami International Airport before flying as a group to Lima, Peru, the sprawling coastal capital city, and spending the night in a quiet hostel near the airport. Day 2: Fly with your group and leaders up to the Andean city of Cusco (keep an eye out the window for giant snow-capped mountains!) before our private driver will take us to your new home Ollantaytambo. Spend the afternoon getting oriented, meeting your homestay family, and letting your body get used to the altitude before your first day of class. 19,000 ft Mt. Wakaywilka. Then, head to class for your morning session focusing on grammar, reading, and writing. Take a break for lunch and head home for a home-cooked meal before going back to school in the afternoon for your conversational work. Get outside and see the town while you practice speaking with your teacher. Take the afternoon to relax or get in a core or stretching session before heading home for a delicious home-cooked dinner from “mama”. Enjoy some “family time” playing cards, watching TV, or whatever the evening might entail before getting to bed for another full day tomorrow. Day 7: Enjoy one last day of classes and say “adios” and “gracias” to your teachers and families. We’ll leave Ollantaytambo in the afternoon and meet up with the remainder of the main program group who will be arriving in Pisac this afternoon. What level of Spanish should I have to take part in the Spanish Immersion Program? Literally any level of Spanish is welcome. We have had students who had never spoken a word of Spanish in their lives. These students developed a strong level of basic conversational ability that helped them get way more out of the remainder of the trip. On the other hand, we’ve had students who were close to fluent in Spanish take part as well. These students reinforced their already strong conversational, reading, and writing abilities and also learned an enormous amount from their teachers about the local cultures, life in Peru, and more. Whatever your level, you won’t leave disappointed. Just like in the main program, we try to allocate two blocks of time per day for training – in the morning and in the afternoon. Most students will use one of these blocks for running or biking, while using the other either to rest, spend time with their homestay families, or do a stretching, core, or yoga session. Is there any service work done during the Spanish Immersion Program week? No. The focus of the SIP week is on language and cultural immersion and athletic training. Between the 5 hours per day of language instruction and training time, it would be squeezing too much in to try to also have a service project. Don’t worry – we’ll learn about and do a lot of work in the main 3-week program! Also, it’s worth noting that Awamaki is a very cool organization that does do a lot of meaningful work in the Sacred Valley. From cultural heritage protection to women’s rights and advocacy, they always have great projects to talk about and you’ll likely hear about a lot of them during your time there. Is there financial aid available for STRIVE programs? Financial aid is currently only available for our main high school programs. You can apply for that and read about it more here. Will my homestay be able to accommodate my dietary restriction (vegan, vegetarian, gluten-free, etc.)? Yes! We’ve had students with just about every type of dietary restriction you can think of take part in this program. The families that work with us are accustomed to working with foreigners and can accommodate any type of dietary needs. Just know that the stricter your dietary restriction, the less variety you should expect. You’re unlikely to find things like gluten-free bread/pasta or soy-meat in a local Peruvian kitchen, but they’ll fill you up with something just as delicious. How are the group leaders involved in the program? What happens if there’s an issue or problem at my homestay? Group leaders are there to make sure the program runs smoothly and be a resource for any issue that might arise. Group leaders and/or interns will meet you for your athletic training session each morning at your homestay and walk you back after. They’ll also meet you for each of your classes and walk you to and from school. If something does go wrong during the homestay, each student will have a local cell phone which they can use to call the group leaders who are a short walk away and can come by at a moment’s notice. Tuition includes: All lodging and meals at Peruvian Home-Stay, beverage with meals, 25 hours of intensive 1-to-1 or 2-to-1 Spanish language classes, training supervision and coaching, domestic airfare and other ground transportation, excursion entry fees, training facility entry fees, group tips for in country assistance. Tuition does not include: International airfare, or airport departure taxes, ISIC card, overweight luggage fees, snacks and beverages outside of meals, personal spending, massages and sports therapy services, internet or cell phone access fees, tips for additional assistance.